The London Reconnections team have been following closely, day by day and (with a few stalwarts) hour by hour, the actual service levels being offered on Thameslink lines during the first week of the new radically reshaped Railplan 2020 timetable. Its tribulations are now raising the stakes for ordinary travellers, some of whom have previously soured memories such as the London Bridge troubles in 2015 and the post-Christmas 2014 Finsbury Park chaos. These memories have been allied with strikes in recent years – particularly on Southern where they have intermittently affected passengers for a period of years. Other commuters are new to such unwelcome experiences. We have covered the policy and operational reasons for Thameslink’s woes so far in The Cicadas Take Flight: Explaining The May Timetable Changes. To some in LR towers though, it brings back memories of the 1997 General Election, when dissatisfaction in ‘commuter land’ was recognised as one of the main reasons that Labour performed well there with Tony Blair as leader. Train services weren’t then a large contributor to the shift in voting intentions – there was a more general discontent with life and times as presented by the John Major government compared to Blair’s alternative vision – which even had some backing from tabloids. Politics moves on though, and we face different personalities and priorities in 2018. Transport, as a whole, still doesn’t feature in the top five national political issues, but continual shortcomings in the daily grind have their impact in commuting territory, particularly if the failings are on a large enough scale, and especially at a local constituency level. We are only one year on from an indecisive national election, yet Brexit, the economy and other topics continue as points of concern. While 2022 is nominally the final date for the next election, if you went to Ladbrokes and put money on another election quickly after the immediate shape of Brexit is resolved next year (or even sooner) then the odds would not be generous. As a result, all parties are likely looking closely at the emerging commuter heartland discontent. It needs to be taken into account. Enter Thameslink (or lack of), stage centre. The immediate Thameslink PPM results for Monday-Friday of the first week of the Railplan 2020 timetable are below. Thameslink PPM on Friday 25 at 21:00 was provisionally 75.3%, 14.1% and 10.5% respectively. Many services at that point were only flagged as delayed and were shown as not yet having departed from their originating station – when in fact they were never there. In addition to the trains initially reported as delayed, there were a considerable number of further cancellations in the late evening. Combined with the reclassified delayed trains, this led to much worse, but more accurate, figures. After the pm peak period, a combination of cancellations and services that do actually run (but are generally late) means that by mid-evening the current timetable is simply not credible. Based on the recent past performance which seems to be deteriorating, there’s no reason for optimism about the service in the next few weeks or months. You can track the current and recent past train service in websites such as: Real Time Trains, Raildar and Open Train Times. For serious Thameslink aficionados, register with Thameslink Buddy for a beta site specifically geared to logging the service run by Thameslink (as explained on their about page ). MPs’ postbags (digital and physical) will already be swelling with the Thameslink failures, and Transport Secretary Chris Grayling (Con, Epsom & Ewell – SWR and Southern) will be at the ultimate receiving end. This leads to the obvious question: what urgent steps can be taken to address the shortcomings? The risk to politicians if the Thameslink issues aren’t addressed and sorted out is that commuting woes will be added to the public dissatisfaction. That will be laid at the government’s door come the next election, whenever it is. The assessments below shows the location of Thameslink routes in relation to 2017 constituencies and the scale of the solidity of the vote in 2017. It does not take account of the possibility of a reorganisation of constituency boundaries by 2022 (a final report on that is expected from the Boundary Commission in September 2018). A 2019 election might have to run with existing boundaries, but a 2020-22 election could have time to be organised around new ones. Overlaying the Thameslink route over the political map suggests some obvious concerns for a government without a full working majority. They will not be happy to see nine marginal seats come up on the transport dashboard all at once. 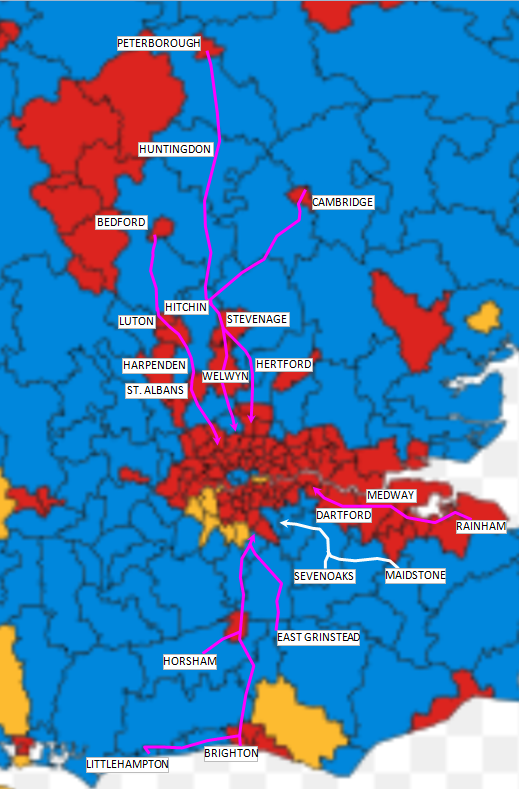 Pink railway lines show current May 2018 Thameslink services and white is a later stage of Railplan 2020, while some pink links are also due to see an intensification of Thameslink providing trained drivers can be found. It should not be assumed that marginality would be limited to the governing party (currently Conservatives with DUP support). The effectiveness of the local MPs in supporting constituency issues would also be a relevant factor. A sample check of Thameslink MPs’ recent communications in local newspapers and tweets to constituents shows that the topic is already making headlines. Here is a sample of MPs’ comments from one Conservative, one Labour and one Liberal Democrat. So, my (no coffee) summoning of @GNRailUK top execs was pretty fiery. I laid it on the line telling them that their service was beyond a disgrace & that their new timetable is simply unacceptable to me and my Welwyn Hatfield constituents… it emerged that delays would continue for six to eight weeks as the new timetable beds in… The timetable will be REVIEWED this Dec and there are two changes I want to see. (i) We want the faster WGC to London journey-time back. (ii) We want at least 3 daytime trains an hour back from all Welwyn Hatfield stations. Many Carshalton & Wallington commuters arrived at stations this week to find services cancelled. Commuters have taken to social media to label the scheme #failplan2020. 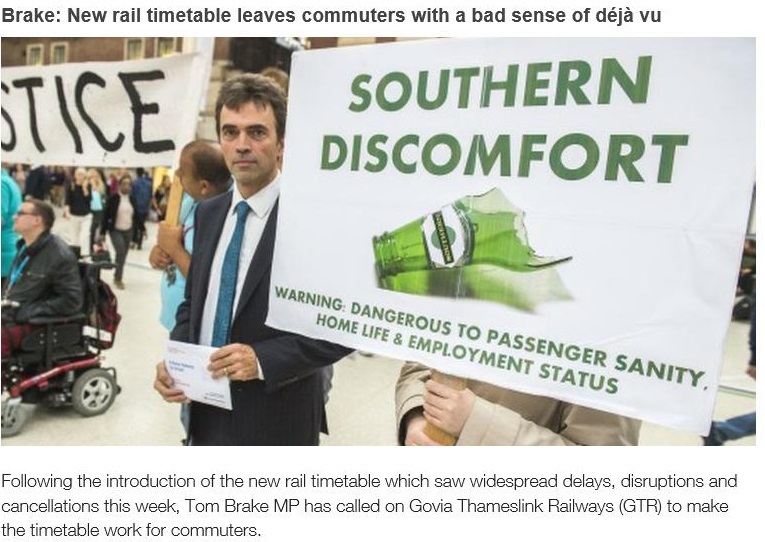 Carshalton & Wallington’s local MP, Tom Brake, commented: “These delays and cancellations leave commuters with a sense of déjà vu — a reminder of the years of misery we have experienced with Southern and Thameslink. “GTR needs to make sure that they keep commuters properly informed, provide good customer service and properly compensate passengers for any delays or cancellations they experience. “It isn’t all bad news though. When the trains do eventually run on time, the new timetable will bring much needed additional services which I welcome. GTR need to get their act together and make sure that the timetable works immediately for commuters. 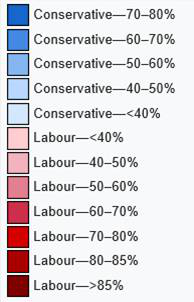 Finally, given that an election might not be too far away, it is worth a look at the distribution of constituencies following the 1997 election. Nothing is impossible in politics, and sometimes previous affiliations are revisited or new ones found. This map illustrates other Thameslink constituencies – with their 1997 boundaries – not listed above as current marginals, but within scope if Thameslink shortcomings were to continue as a major local cause of concern. Constituencies include (north to south): Stevenage, Welwyn Hatfield, Dartford, Gravesham, the Medway Towns group, and Crawley. In some cases the Thameslink service is only a proportion of the total train volume. Where it is the main operator then the commuter pain will be greater. Our look at Thameslink’s latest timetable change demonstrated clearly that the Government cannot disassociate itself from this week’s failings – because of its persistent refusal to address driver shortages even at the start of the Thameslink franchise specification, and because the minimum number of new Thameslink trains were ordered with no practical margin to cover any stock shortfall. The result of that failure is now plain for all to see, and it enables opposition parties to critique with more force the DfT’s rigid control of TOC franchise specifications, and the general franchising policies. There may have been merit in having a single train operator in charge of timetabling, staffing and other resourcing for one of the more complex projects this century (the next will be the single TOC for WCML and Early HS2 services). However, thus far the results will have negative feedback in local constituency postbags. The history and role of the railways within many marginal constituencies is illustrated by previous historical examples. The North London Line survived against the odds in the 1960s because of its volume of marginal seats at national and London electoral levels. The line’s inclusion on the Tube map in 1976 was also down to political reaction to proposed service reductions. Thameslink has the potential to become a new political litmus test for commuter services in London and the South East. It is likely to consciously contribute to railway policies becoming more of a manifesto issue for the next election – particularly if that election is sooner rather than later. Its subconscious impact, however, should also not be underestimated. It has long been a political tenet that a sunny election day helps the government, because it puts people in a good mood. One suspects that no amount of sunshine will cheer up a commuter who feels they can no longer effectively commute. It is not just the weather that can subtly affect public perception in the commuter belt now. It’s timetables too. I’m glad I don’t rely on the service from my local station any more…..this morning there was a 90 minute up direction gap in what is normally a 2 tph service. These trains are busy normally. It must be hell. With half-term here and no car l was planning lots of trips with the kids to see family in Kent, go to Brighton – but the experience of travelling last week was horrendous. How many others will put off using the train for such trips as they are too risky with children involved? My local station on the ECML had almost 60 cancellations on one day last week alone. Politics? I’ll be voting for a party that promises to undo the private network and take back full public control of the national rail network. Hopefully either taxes raised proportionally you cover the additional investment needed. “right-thinking tabloids” – rather than wrong-thinking tabloids? Maybe “right-leaning tabloids” would read better? – politicians take credit for successes and pass on blame. It’s been that way for at least 2,500 years. – the above passengers blame politicians for problems with their journey, and credit them not with on-time trains with a seat. – the public as a whole has no idea which bits of the rail service are nationalised (TfL, Network Rail) and which are actually private. – when a member of the travelling public blames a politician, it might be a national one (the current Minister for Transport, the PM) or their local one. So, @ISAMBARD example… A couple of “missing” trains. But if it’s not a major stop then there is little revenue loss because it gets lumped into annual season ticket prices. But, the DfT take the risk on those, and get to pay a few delay-repays. To Govia Thameslink Railway it doesn’t really matter because they get paid to own the franchise, rather than running actual trains (more or less). What can a politician do beyond Tweeting when it’s against their opposition’s, or ignore it if it’s uncomfortable for “their side”. While commuter dissatisfaction may give a general swing away from the incumbent (the 1979 election also saw a swing to the conservatives in the south-east ascribed to commuter dissatisfaction) where a party is opportunistic in taking advantage of this, the swing can be much greater. 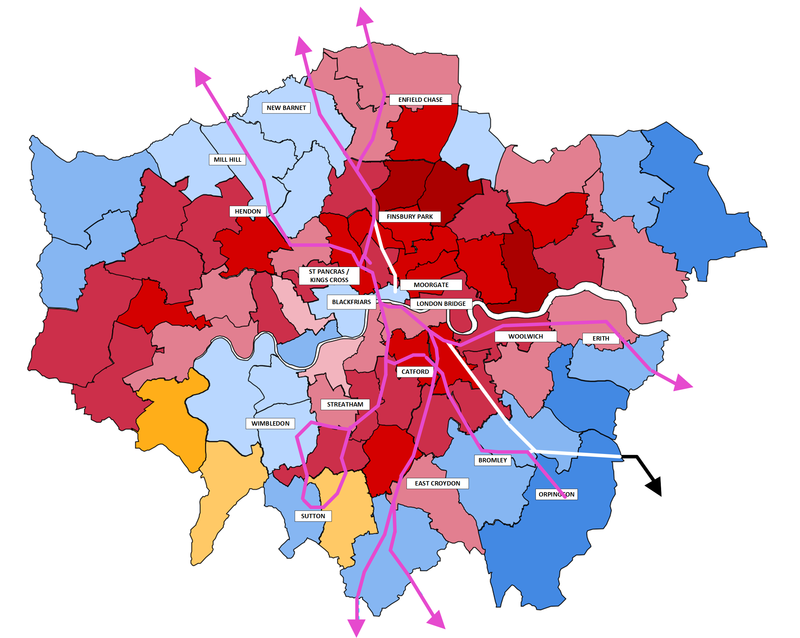 The 2010 election saw the Conservatives win 4 marginal seats in west London with one of the main reasons identified being opposition to a 3rd runway at Heathrow. More locally, Ealing swung dramatically to the Conservatives in borough elections in 2006 on the strength of their opposition to the West London tram proposal. This was clearly shown with the swing being greater in wards that were closer to the line of the tram route. As the main opposition party in most of the Thameslink marginal seats this clearly shows that the more Labour campaigns on improving commuter services the more they are likely to benefit. Additionally you can factor in commuters who aren’t on a Thameslink line but have been negatively impacted by the overall timetable recasting, most of whom will still attribute this to the Thameslink programme. I wonder whether premonitions of the recent problems, along with the VTEC / LNER debacle and inevitable U-Turn, had anything to do with Failing Grayling surviving in post during the last reshuffle? Lots of the commentariat (eg Economist) predicted his departure after so many additions to his long, lamentable history of blindly doctrinaire, badly executed policy decisions (eg disastrous part-privatisation of the probation service), so leave him there to suffer and maybe can him later to demonstrate a firm smack of control if and when things go truly pear-shaped. Probably more to do with May being more scared of the Brexiteers than Remainers, but the walking definition of the Dunning-Kruger effect must surely emerge at some point from whichever bunker he’s hiding in to face the music? Although… to be fair and through gritted teeth I would admit that the seeds of the VTEC problems were sown before his watch..
@B&T: It doesn’t matter when the flawed decision was made, the head that will roll is the one holding the hot potato when the music stops. I think I should top mixing metaphors at this point! Notably those now having to use a bus between Wellingborough and Bedford – which will include many constituents of the marginal Corby constituency. Interesting that two of those nine marginal Conservative MPs are former transport secretaries (2010-12 and 2012-14), and the current timetable is partly shaped the way it is due to the direct intervention of one of them. This is why all day, or all week PPM stats are basically useless. To show the effect on the most people you need peak flow stats. What you need to know is how many peak time, peak direction trains, or, better still, how many total passengers were delayed? As has been mentioned before, transport is about moving people, not trains. It seems like the transport companies and the DfT often forget this simple fact. Some mentions for commendable engagement by MPs not mentioned in the story – from the south: Brighton’s Caroline Lucas (Green), Horsham (Balcombe)’s Jeremy Quin (Con), Hitchin and Harpenden’s Bim Afolami (Con), Luton North’s Kelvin Hopkins (Ind), Bedford’s Moh Yasin (Lab) and NE Beds Alistair Burt (Con). @Timbeau – yes. You could also add to my list for commendable engagement Peter Bone, Wellingborough (Con) and Tom Pursglove, Corby (Con): as you say, a marginal. Wow….I never thought LR would ever do such a political article! This is going to be interesting to moderate…. GoVia/GTR are running the service as directed & (mis)-controlled by the DfT who both specified the service & appeared to screw up the non-recruitment & training of drivers …. Meanwhile … The general drift ( Piling up in heaps, as drifts do … ) of information seems to point in the direction of DfT. Add that to NGH’s comments in the previous thread which strongly suggest that GoVia/GTR have an absolute “get out of Jail” card that they can play if backed up to any wall. Which almost certainly means that, sooner or later, DfT will get to carry the can ( A recent House Committee report suggested similarly, IIRC ). Which means … Mr G & some of his subordinates will have to be sacrificed. Unfortunately, that does nothing for the travellers & commuters, unless there is also an actual change in policy – I think. Very interesting article, I just wonder if absorbing Thameslink into TfL might improve things in a real sense; and possibly absolve MPs in the political sense? Given Grayling’s lack of enthusiasm for services in Epsom to be run by the Mayor of London, I doubt that he would want Ashford, Bedford, Cambridge, and Durrington-on-Sea to do so. And I would hope that TfL would require TL to get its house in order before any handover. A very interesting contrast & juxtapostion there. Given that, in just under 7 months time, we are going to have two very contrasting sets of cross-London services running. And the first major, centre-section of the “Lizzie-Line” – which will be “owned”, certainly operated on behalf of … TfL. OK folks, it’s time to stop the blame game and get some professional railway people in the DfT, NR and GTR. For changes like this, you need a plan and a fall back plan. The 2020 timetable should be in final draft by now so duty rosters can be calculated and staff requirements known. If you need more drivers, allow a 2-2.5 year phased recruitment start to allow for training, dropouts, road learning and stock training. You can’t rely on poaching and transfers. There should be an emergency timetable for each route and an emergency roster agreed with staff reps. in advance. These lessons should have been learned after the London Bridge debacle. When examining the “blame” for the current situation, a divide can be made between mistakes made by the DfT (i.e. the government), Network Rail (the nationalised body running the infrastructure) and GTR, the operator. I think EXPICCDRIVER has summed what needs to happen in a few well chosen words. The difficult part is the 2-2.5 years as no politician will want to hear that. At a guess there are some very significant efforts underway inside GMH to identify plausible (but innocent) scapegoats! The electrification of the Cross-City line in Birmingham is regarded by some to have gone ahead due to the unfortunate death of the MP for Mid Staffordshire (Lichfield) which is at the northern end of the line. Electrification announced 7th Feb 1990, bye election 22nd March 1990. The governing party lost. On a positive note, I have seen an improvement on paper as I have additional trains and through trains to Bedford. I live on the Oxted line. However, it has yet to be fulfilled in practice and it has negatively impacted existing fast services as they are sat waiting to join the main line at South Croydon for around 5 minutes where as previously this was not an issue. The new T/L services have been cancelled en-masse with lack of train crew being cited as the issue. That’s poor on day 1, at best, on day 8 that’s shocking. It’s not beyond the wit of man to work out how many crew you need to run the new service or where they need to be at any one point. If you don’t have the crew, don’t promise something that you cannot deliver. Today some T/L’s were simply missing (not showing as cancelled, not showing as delayed but removed) from the timetable and the arrivals/departures boards on National Rail. I can’t help but agree with EX PICC DRIVER and his views. Get some professionals in. As for the politics – it’s true blue around here and a very safe seat. I have written to my MP in the past about Southern’s performance during the strikes. I lost (was unable to earn) a fair chunk of money as I could not get to work at my agreed contractual hours so had to take unpaid leave. It took a few months to get a reply and it was, in my opinion, the same letter he sent to everyone else. I don’t think he gives a damn as his seat is so safe. Getting in anyone else won’t produce a different diagnosis or a radically different action plan to address the training gaps. We are effectively 2.25 years into the 2.5 years already and this is now just about bridging that last ~2month gap. Taking the example of the Oxted line – The East Grinstead services are mainly driven by former “Southern” Drivers who have the route knowledge to go into London Bridge Terminating platforms, then later got traction training on the 700s and route training through the core etc. via Elephant and Castle but many still haven’t yet got the training for the route between New Cross Gate and Blackfriars via London Bridge P4&5 yet, which means they need a pilot between East Croydon and Blackfriars and v/v or they have to take the slower route via E&C + Tulse Hill + Palace as quite a few did last week. Re: NGH – How fascinating that after all these years the mainline operation out of King’s Cross still sees itself as the “top link” to which drivers of lesser services should aspire! While I understand the argument put forward in the article it all hinges on how long the “agony” lasts. Most people have other priorities, short memories and / or they make adjustments to reduce the personal impact of external things like train problems. I’ve read several recent anecdotal remarks that people have simply stopped using trains and have switched to cars because they cannot risk being late for work etc. As per earlier commenters I’ve cancelled more than one planned trip out as I won’t take the risk of being stuck for 2 hours waiting for a train. However if / when services stabilise then people may well switch back to the rails. If they don’t I can’t see the SoS being overly concerned as he is unashamedly pro motorists. As the article suggests it is extremely rare for transport matters, other than the cost of petrol, to have any bearing on national politics and general elections. Unless GTR are operating the same shambolic service come 2021 then Thameslink woes will have no bearing on any general election. I don’t expect this government to give up the ghost much before 2022 – they’re too determined to hang on regardless of parliamentary mathematics. It is also noticeable that the Mayor has been decidedly subdued in his response to the current Thameslink woes. This suggests that either something is under discussion that requires his relative silence or simply that he doesn’t see much political advantage given many of those worst affected reside outside of Greater London. Like many I’d like to believe transport is a higher transport priority for people than it actually is. Then we might get something bordering on rational policy choices but the last 100+ years tells us that no such thing has ever happened in this country. We lurch back and forth between philosophical extremes with all the expected negative impacts of inconsistent outcomes and imperfect investment. The unseen trouble is that there really are people inside the DfT who know about real railway operation(s) & relevant technical solutions – who are almost all of the time ignored by the doctrinaires “in charge” – only to be proved correct after it’s all fallen apart. Which makes them even more popular & unpromoted, of course. Which is entirely as it should be! NGH………you may not have intended this, but you suggest that they are nearly in a position to end the disruption and this is all part of the plan. I have to express some surprise, given the scale of disruption. I completely understand that not everyone is trained to go where the trains were planned to go, but surely if they are this close to the ‘end of the 2.5 years’ they could have declared in advance what would and would not run in some sort of planned way so that customers could plan their journeys? Judging by what I have seen on my limited exposure to social media this last week or so, it’s the unpredictability of it all that annoys so much. The PPM measure looks a lot less bad than the reality of travelling (e.g. Friday mid evening with no confirmed train times displayed at Kentish Town in either direction). I’d be interested to know if the 2.5 month trained workforce gap became apparent when it was too late to postpone the long-planned switch until December. If not, there must be people responsible for having decided, unwisely, to push on with what will go down as the mother of all ‘operational incidents’. If it doesn’t improve sufficiently and spawns political will to dust down TfL devolution ideas, then I can’t help thinking that simpler / less interdependent ‘metro-ised’ route patterns would be a useful outcome. I’d say it should settle down by the beginning of August but June and July will be pretty torrid but seeing gradual improvements. Last week some TL services (Peterborough – Horsham and Luton – Rainham required 4 drivers in the worst cases so every bit of extra training successfully completed can make a useful impact and reduce that to the current target of 2 (with driver change at Finsbury Park in the case of the former), there is a significant multiplier effect with extra trained drivers even if only for short section of route or stock conversion (e.g. Ex SE drivers needing a 4? day course on the 700s). What won’t be mentioned is that Southern performance was pretty good today given extreme weather at times with 87% on time (1875 services) on time and just 5 services cancelled all day. Southern is still 66% of the franchises services which helps dilute the TL and GN performance issues in stats. I must say I do find “I have told them to fix it. Right now.” statements from politicians to be rather tiresome. Everyone involved is most definitely trying to fix it already. @ M Jennings – Completely agree but Mr G would say “he is doing something” even if it means he’s just yelling at people down the phone. It’s just another deflection tactic and also a further attack on Network Rail (a continuing theme from Mr G). More worrying is the statement in his letter where he says that he will stop major timetable changes happening in future due to his view as to Network Rail’s timetabling competence. This ignores the fact that it is the TOCs who provide the inputs to the timetable process. When I saw his statement that immediately rang alarm bells as to what happens with Crossrail. Clearly Dec 2018 is OK as the core is independent of other services. However the May and Dec 2019 changes could fall within his “major timetable change” stance and that must be especially worrying for TfL and everyone else. I’d argue it’s the Dec 2019 that are the most involved but it must now be too late to start unravelling how those changes are introduced. @WW: Just as well he’ll likely be off before HS2 kicks in…. The man’s idiocy knows no bounds… How is he planning on launching HS2 services without a major timetable change? Not that there is any chance he will still be in post by then, just another deflect-the-blame-without-thinking statement. In his letter to MPs, Mr Grayling has blamed Network Rail for failures in planning and implementation. I presume that if the latter cannot be persuaded to resign, the former will have no option but to dismiss him. It is not NRs responsibility to resource a timetable as proposed by a TOC, only to ensure that it is coherent and theoretically deliverable, and fits alongside plans from other TOCs, ASSUMING the resources are provided by the TOC. NR train planning cannot be blamed for failures in the availability of crew and rolling stock. Perhaps NR needs to take on managing these aspects of operations as well! Just as when one particular set of major projects goes wrong among many thousands that are delivered successfully by NR, this particular timetable meltdown is not a case for dismantling a centralised timetable planning function within that organisation. If NR does’t do it, someone else will have to instead. How can there be any confidence that after yet another disruptive reshuffle and reallocation or responsibilities that any new such organisation would be any more successful. It’s a smoke screen anyway as (I say it again) NR are not responsible for resourcing the timetable. I believe the phrase “Brass Neck” covers the situation quite well ….. Given what we know about DfT’s ( & hence Mr G ) input to the timetable & crew recruitment & during the Southern strike & now this …. I mean, how long can he continue to get away with this continual diversion away from matters that are either directly or indirectly his responsibility? Something I’ve heard from multiple senior sources is that they genuinely don’t believe that he’s receiving a lot of direction or oversight from the cabinet or PM at the moment. Purely because Brexit and all its fractious trimmings are dominating every cabinet session and discussion. So barely anything else receives time for discussion or debate. This is doubly true for Grayling as he’s seen by the PM as a an ally of sorts – because he’s a soft-brexiteer. So right now, Grayling is pretty much immune to criticism (or notice) from within the existing hierarchy. He won’t be getting promoted any time soon, certainly, but then he knew that already. He’s been told he’s at Transport until he gets a ‘major win’ which most sources equate to being seen opening Crossrail on time. Essentially he’s safe unless it looks like we’re getting an early election, and then only if things get so bad that they start making some marginals look dodgy (hence this post). How long before Mark Carne or, better still Peter Hendy, point out the, erm inconsistencies in the current minister’s stance? @ Mark T – Of course it is a smoke screen – that’s the SoS’s speciality. I just find the never ending attacks on Network Rail to be depressing and worrying. We all know, in broad terms, that Grayling is dismissive of NR, hates how much it costs and he believes the private sector is better than public. This is why we have all this “partnership” guff and “alternative” delivery vehicles for schemes like East West Rail. It’s a case of anything but NR for the brave new world of future “Grayling Rail”. That all of this will most likely lead to utter chaos, a lack of accountability and risk sitting on the DfT’s desk seems not to matter very much. As you rightly say someone has to be the “guiding mind” as to how and when trains move round the network and to ensure they do so in a way that is safe. I look forward (not) to Mr Grayling’s announcement that he is either privatising the NR timetabling function or else wholly devolving it to the TOCs in the same way that the DfT washed its hands of the control and oversight of smart ticketing on the network. Yet another financial and technical catastrophy that was brushed under the carpet. Bring back Patrick McLoughlin – not perfect but far, far better than who is there now. (I understand he doesn’t want the job now but one can dream). There is currently no accountability for failures of this scale on our railways. Someone somewhere needs to take responsibility for this massive project management failure, and do the decent thing and resign. @ChrisMitch: The current batch of politicians are bad, however do we really need to consider the alternative as being a serious proposition? Are you trying to hint that Mr G wants to re-invent … “Railtrack” ( a private company ) mismanaging running the show, with or without actual engineers present? By all means undertake a thorough speedy review to understand what went wrong but dont risk throwing ‘baby out with the bath water’ that could risk undermining the whole sector! The real reason that heads should roll at GTR and DfT, is that the problem with insufficient drivers being trained on the new stock and routes IS IDENTICAL to what happened on Thameslink 8-9 years ago with Class 377s. Is this problem really that they failed again to deliver the training on time, or is it that Govia, in order to win the franchise, cut driver numbers to save money and therefore didn’t have enough spare to allow drivers to be released for training. Will we ever know; the guilty parties aren’t going to admit to their failings are they? Also new infrastructure ‘drives’ and ‘enables’ new timetables to deliver new and improved connections and frequency. No new timetables sounds like a recipe for zero growth, zero development, no new services, no new infrastructure. a) Part of the problem is that the huge quantity of training (new and existing drivers) that needed to be delivered would take very long time to deliver without cancelling existing services (assuming you don’t hire and train extra drivers just to cover for training!). The very long time extended back to needing to start during the previous incumbents tenure and both Southern and FCC told DfT that they would need to fund a driver recruitment and training programmes in the old franchises (6 years ago) due to the lead time needing to start before the new franchises took over. e) IR issues at GTR so it is very difficult to get enough drivers to become Driver Instructors to do all the training. I don’t think the intention is ‘secretly’. If you know a train isn’t going to run then the best thing to do is to remove it from the relevant database as soon as possible so it doesn’t appear on Journey Planner. That said, a very fortunate side effect for GTR is trains than never make it to Journey Planner don’t get counted for Public Performance Measure (PPM) statistics purposes. So Northern Rail’s PPM measure actually improved on guard strike days because they had already removed the trains they couldn’t run and the ones left generally did run and generally to time. A frustration for passengers is that it was said that the trains being cancelled in advance counted as cancelled for delay-repay purposes. But, if you think your journey was only slightly delayed when in fact it was significantly delayed because a cancelled train had disappeared, how would you know? My understanding is that the issues up North are clearly Network Rail’s making. But nothing to do with the timetabling team. The project team in charge of the Bolton electrification project only put their hand up in January that they will be late by at least 6 months. This left both the TOCs and Network Rail with about 1/3 of the time required by the timetable planning process to roll out a viable and properly resourced timetable. Naturally, that didn’t really work out too well… If you tell a surgeon he has 30 minutes to do a heart transplant the patient will end up in a coffin. Down south, as ngh rightly points out, the timetable change was massive, and planned to death. As far as I understand, the first Network Rail development timetable for Thameslink was written in 2011. It was since updated and changed hundreds of times, due to the whims of successive SoS for Transport (Wimbledon Loop, anyone? ), and as a result of months and months of modelling that eventually proved that you can’t squeeze a quart into a pint pot (for pint pot: read East Croydon) and Thameslink services will have to go somewhere else. – GTR did not have enough drivers. Everybody has known that for years. – The deliveries of the Class 700 units were delayed, costing yet more drivers (for training runs & mileage accumulation). – The timetable change had to be – by definition – a ‘big bang’, as it had to be a simultaneous change for GTR, EMT, London Overground, and Southeastern. Quite why it wasn’t stopped and delayed in time for operators to revert back to running the existing timetable until December we will never know… My money is on political pressure from the DfT, particularly given the fact, that it has a greater level of control over GTR than over conventional franchises. And now Grayling has the cheek to blame NR’s timetablers? Either he is genuinely thick or he is trying very hard to deflect the blame away from himself. The differences between the timetables submitted and those approved created a requirement for training that had not been anticipated. This meant that the necessary specialist training was not able to be completed in time for drivers to learn new routes and for operators to address all the logistical challenges. that then proved impossible once NR had gone over it for quality and b) does not work if the goalposts for day 1 move. @ngh: Which only further strengthens my argument that Network Rail’s operational planning team in Milton Keynes is doing their very best. Unlike the DfT and the man at the helm. Bolton (late) electrification and route modernisation: A sordid history indeed. c) some older construction work was not done to standards or drawings in the BR era – one of which was discovered when a bust water main washed away a cutting wall and destabilised a bridge resulting in substantial line and main road closures. SoS: Are you resourced and ready for this historic once in a generation change ? DfT simply needs the money from more passengers to make their budget work which introduces a “go for it” bias if in doubt! @ngh – seconded on the point about the TT planners and I get the random word generator thing a lot too! Dotted throughout many, many LR articles and comments are statements about who controls/manages/owns what within the railway industry, in addition to lines of responsibility, and specific instances of contractual obligations differing from the norm (eg GTR’s current). It would be really useful, especially for people outside the railway industry (like myself) who struggle to remember the convoluted facets of it all, if there were a single article which contained all of these things as a list, along with which group the item falls within the remit of. As a reference source, it’d make it far more transparent when a press release is designed to deliberate obfuscate responsibility and shift blame unfairly. The playing field seems terribly un-level in this respect, as Graylings letter demonstrates, because there is still massive confusion (and apathy) amongst the public as to who is actually responsible for what. I suspect it has come to the point where such confusion is seen as good because it allows people/groups to cover themselves and their own failings, with the whole issue then becoming a PR war, which might result in people using their political biases to inform where the blame lies, rather than reality and contractual clauses. A hearfelt plea from Ben. However, as you surmise, who is responsible for what ultimately depends on complicated contractual issues, set up by teams of lawyers and impossible to summarize simply. It would also be something of a moving target, because part of the response to things going wrong involves inventing new structures and contracts. The architects of privatisation thought it could all be spelt out once for all, and everyone would understand. Sadly, the structure created then, quite apart from being already complex, has not stood the test of time at all well, and has suffered numerous tweaks and rewrites, which are probably still going on as we speak. As far as the structure of it all is concerned, there is one thing I have always found deeply stupid. The DfT is in control of the franchise contracts for each TOC, specifying the train service requirements, as well as the service level commitments (one is for the franchise bid process, the other is in the franchise contract). It is also in control of Network Rail’s renewals and maintenance budgets, through the High Level Output Specification/Statement of Funds Available process, which occurs every 5 years. Now, the current Timetable Planning Rules, which Network Rail and the operators use to build the timetable, do not often accurately fit the actual capabilities of the infrastructure. This is due to a variety of reasons: mis-specification of the rules, degrading of infrastructure capability after x years in service, trains lengthening over the years – all sorts of issues. As a result there are sections of the network, where there are more trains running than the infrastructure can actually handle. This leads – inevitably – to delays during the a.m. peak, when the infrastructure is most heavily used. The joke is: Network Rail can only change the rules with agreement from all operators involved. Trouble is they will fight any tightening of the rules tooth and nail, as often a tightening of the rules means their trains will start dropping out of the timetable, as there will no longer be any space available for them. And – of course – trains cannot start dropping out of the timetable, as they are under obligation to the DfT to run them. So: DfT controls the purse-strings of Network Rail, which then determine what infrastructure investments can be made. They also specify (with barely any input from Network Rail, might I add) how many trains each passenger operator is supposed to run over each line. And when they get it wrong, they watch Network Rail and the operators have a long and protracted fight over whether to fit in the services or not. Even though they are the ones responsible for (a) not providing enough funding for infrastructure; (b) forcing too many trains onto said infrastructure. The reason for this farce is that the structure of the process was tailored at a time, when Network Rail was called Railtrack and was a private company, with barely any state control or oversight. Network Rail has been in the public sector since 2013 (if I remember correctly). When will the DfT finally accept its full responsibilities and resolve these issues? And, furthermore, if the DfT is more than happy to heap blame of all kinds on Network Rail without taking responsibility for its part; is a full-scale nationalisation of the railway really the right way forward? Perhaps London Overground should take over Thameslink. In the 1990s the Australian state of Victoria privatised its rail services. It is the only place I know of that consciously copied the British model of rail franchising – they even hired Roger Salmon, architect of British rail privatisation, as an advisor. The conventional wisdom is that regular public transport users are a 12% minority and that most people who complain about public transport never use it. However, chronic problems plagued the system and contributed significantly to difficulties in the lives of commuters on a daily basis struggling to get to and from work. For those who consistently use public transport, it is a very important part of their day and affects their capacity to meet regular work and family commitments. In some of the seats listed above, (St Albans for example), more than 25% of the population use Thameslink to get to work. Add in their families and you have a significant voting bloc. Even Reading on the Lizzie-line is a long way “out-of-town” for a TfL service & is a special case. AND, it’s a dedicated, all-stops metro service, whereas the “slink” is anything but that, apart from the Wimbledon Loop trains. It is mostly a mixture of very-much-outer suburban/interurban services & some almost-expresses. Even if government were to allow this ( Extremely unlikely ) I suspect TfL would not want it, as its operating conditions & service patterns are well away from what they usually do & also out of their “comfort zone”. Now there really is an interesting comparison. I wonder if any of our politicians are paying attention? North of the Thames – most of the local MPs as well already selected candidates from other parties (usually sitting local councilors with more (often superb) rail knowledge than the incumbent) are all massively on the case and going for or trying to get meetings with Grayling to lobby for local changes for themselves (before they get done over by the neighbouring MP etc. asking for mutually exclusive things) if they didn’t like the outcome of the 3 consultations GTR ran or DfT’s emergency decision making in the case of Harpenden etc. They are also all seeing GTR along with local rail user group reps but most have twigged that this is nothing to do with NR so are focusing on GTR and Grayling. The opposition candidates are also telling their supporters to suitably goad the elected politicans with do this or I’ll move my vote to Y to whip up a frenzy as they are expecting this to linger as an issues. Local activist groups are forming and getting ready for battle. @Ianno: Did you vote Leave by any chance? – EU law does not state the competent authority cannot co-ordinate the number of services it specifies with the amount of money it spends on the infrastructure manager to provide the capacity to operate these services. Indeed, I think the ability for such co-ordination is at the very heart of what makes the authority competent. – Infrastructure manager = generic EU term for the entity that runs the rail infrastructure. In Great Britain this is Network Rail. – Competent authority = generic EU term for the public entity that specifies which and how many services should operate on the railway. In England this is the DfT. Is the UK Competent Authority competent? @ Ian J – an interesting story from Australia. IIRC the Victoria State government also had huge problems with privatising the Melbourne tram network which ended in a shambles. I believe they also had dreadful problems with a smart ticketing project that didn’t work properly, was badly specified and cost a fortune. When you chuck in the rail network problems too I can perhaps see why public transport issues became a vote changer in that state. I just don’t see it translating across to the UK. We had a general election last year when the Southern guards dispute was still raging with huge consequences for many people. Did it alter the votes gained by the Tory Party in Surrey and East and West Sussex? Can’t recall any great political fall out from it. Similarly South Eastern’s performance has been dreadful for years but did Kent change political colours to any great extent? – nope! Clearly the election was a disaster for Mrs May but that’s a different issue altogether. I think anyone living in hope that Thameslink’s woes will create a political earthquake to overshadow the “B word”, the economy, NHS and education is resident in a land of clouds and cuckoos. I don’t doubt what Ngh says about what MPs are currently trying to do re GTR but I’d argue that’s them at least trying to do their job. Opposition parties are completely unable to articulate a clear workable alternative to the current structure of the rail industry. For those who yell “nationalisation” then I don’t believe Labour have a clue what they’d do and how they’d fund the restructuring and cope with the knock on consequences to service performance and investment. And as to the oft repeated promises of “cheap fares” and “loads of extra and new trains” well excuse me while I laugh in a corner. Again no substance as to how any of this would be delivered in a sustainable manner. I am not an advocate for the current mess either but no one can explain what an alternative would look like and how it would work and be better than today. Until that happens then I’ll just carefully ignore the trite simple blandishments that politicians throw out to the waiting media crowd. Did it alter the votes gained by the Tory Party in Surrey and East and West Sussex? Can’t recall any great political fall out from it. Of course not. But because the unions were involved all it did was cement entrenched views. So the Tories think it is the fault of the unions and all the more reason to vote Tory. Labour voters are convinced it is a government and privatised management problem and vote the same way as they have always done as well. That is why there was no article on ‘The politics of the guards dispute’. This situation is different. The unions (very sensibly from a tactical point of view in my opinion) have not got involved in word or deed, concerning London at least, so the blame cannot be deflected onto them and nor can the focus of attention. The Mayor (the London one at least, not the Manchester one) seems to be very much the wiser now and probably realises any comment from him will distract attention from the shambles that enfolded. @ Ben – I understand your desire for clarity. It’s best for JB to respond re the value of an article or glossary to “explain” the rail industry. I disagree a bit about the public’s view on all this. I don’t think they really want to understand the industry structure. They just want the trains (or buses or hospitals or schools / whatever) that they use to work properly. They expect professional people to run things properly for them. Only a minority are interested in the minutiae of any system or service and even then only when it aligns with a personal interest or if they’ve been negatively affected and want “justice” (e.g. after a fatality or serious incident that affected them or their family). I think it has long been the position that a lack of clarity helps obscure who is to blame for a mess. The decline in professional and competent journalism, ironically driven by the use of the internet and social media, compounds the lack of understanding amongst the public. I will now sound old but oh for the days of World in Action, Panorama (when it was a decent show), The London Programme, Dispatches and many other high quality, effective investigative television programmes. I’ll stop before I launch into a semi political tirade and sound even more like an old git but we live in difficult and interesting times for public debate, the “truth” and political accountability. @Walthamstow Writer: I wholeheartedly second that. – It was created when the management of railway infrastructure was in the hands of a private company (Railtrack). This is no longer the case – hence the relationship between Network Rail and its principal funder (the DfT) must be streamlined. – It does not take cognizance of the fact, that the revenue risk in the commuter franchises of South East of England is largely connected to the state of the wider economy (and the emergence of telecommuting), and is something the franchisees have little (if any) control over. – The franchise bidding process is a mess that the DfT cannot seem to get a grasp of (I can’t remember the last time an Invitation to Tender was issued when the DfT promised it would be); and bidding timescales are too short to develop timetable proposals properly – thus resulting in the franchisee’s actual timetable barely resembling the timetable that all its revenue predictions were actually based on. In summary, I think the current franchising process is deeply flawed. But nationalisation is not necessarily the solution. Similarly South Eastern’s performance has been dreadful for years but did Kent change political colours to any great extent? – nope! That’s because you are from north of the river and probably don’t understand South Eastern politics or history. From all that I have read on the subject, there does not really ever have seen to be a time when trains ran to time on what is now Southeastern Metro through London Bridge. Even on the London and Greenwich in the days when trains only ran between those two termini, there seems to be bad timekeeping. I doubt if there has ever been a consistently good service to Charing Cross and Cannon St. In fact, until a couple of weeks ago and the non-introduction of Rainham trains, that metro area probably had the best, most reliable, service it has ever had. Basically, those in the south east have never known anything different – other than being even worse when Connex ran it. My understanding is that EU legislation requires a separation of the infrastructure manager (which assigns capacity) and operators, to prevent the state-owned infrastructure manager from protecting the state-owned operator by telling new (private) entrants that there’s no capacity available. That is clearly not the case in the UK – if the DfT and Network Rail were more closely aligned the worst they would do is get rid of the open-access operators, but would still preserve competition in the form of franchising. >Basically, those in the south east have never known anything different – other than being even worse when Connex ran it. I think you just hit the nail on the head there! And the same could be said for thameslink too – at least in the time I’ve been using it, prior to 20th May it was running reasonably well. @ PoP – being strict about it I am from a long way north of the river but have obviously been down here a long time. I take your point but I do find it odd and lamentable that a rail network has never run to time for longer than living memory. It seems doubly odd given the moans and complaints we get about performance coupled with the moans and complaints whenever anyone proposes doing anything to change matters . Perhaps TfL are actually well off from not being granted devolved control over services that are seemingly incapable of ever working properly? Before I am reminded by our Kentish contributors obviously there have been changes in the longer distance routes in living memory with the advent of HS1. I am thinking more of inner suburban services which seem to be set in aspic that guarantees they run badly. @ Straphan – Don’t disagree with your diagnosis. Two comments. 1. DfT clearly are trying to “change” the NR relationship by making it far harder for NR to undertake and justify enhancement projects. The lack of transparency around this is concerning even though I recognise DfT / HMT will have legitimate concerns about past spending / project implementation / overruns. 2. The role of “independent regulation” also seems to be unclear now. With government so tightly controlling everything is there much point to ORR? I know open access and freight operators look to ORR for “protection” of their rights to operate but I wonder whether ORR has any real power given the spread of control DfT now has. I get the sense DfT just does as it pleases and no one can do anything and certainly no one openly complains for fear of the consequences. On your revenue risk point I think the disconnect is much wider really. I understand the theoretical position about what sort of TOC is best suited to take revenue risk but there are very few TOCs that are entirely insulated from the economy and commuter / business related revenues. Mixed traffic TOCs like GWR / Transpennine / Scotrail / East Midlands are all vulnerable to changes in employment in the multiple cities / conurbations they serve. Some Inter City TOCs have enormous business travel and commuter flows and they also have the other vulnerability around discretionary spend on leisure travel declining sharply when economic woes loom. I’m much less convinced these days that it is sensible to have TOCs bearing revenue risk when we are likely to see economic turbulence for many years to come and when the DfT exercises so much control and also when there is more partial devolution in places like the North / North West and the Midlands. The TOCs don’t really have any freedom to do anything revolutionary or major in scale. Why lumber them with risk they can’t do anything about? @DJL, PoP: It normally runs reasonably well…. Certainly when compared to the suffering some of my colleagues have to endure (SWR, Southern/GTR). However with the Lewisham incident (freight train falling over). I thought their response was more than useless, Moreover their response didn’t improve on subsequent days, which is utterly shameful! I’m glad not to have the suffered the Connex days though, they must have been awful…. I believe that a TOC needs to give between 24 and 48 hours notice minimum to amend the Journey Planner timetable (basically one clear day). This makes some kind of sense as it is a performance measure against the (online) published timetable. After that time any changes (such as cancelled) are short term notices which will show up (as a cancellation if cancelled) so PPM will take that cancellation into account. So, in answer to your question, they can amend Journey Planner and flag trains as cancelled but that won’t affect PPM. Northern had the good sense to remove their trains that wouldn’ t run because of a planned strike days in advance. I suspect sometimes TOCs don’t do that because, if the strike doesn’t take place, it is a lot easier to reinstate a cancelled train that to enter all the details afresh. Obviously PPM isn’t the only relevant factor when measuring a TOC and the service they are attempting to provide is a separate consideration – otherwise why not cancel every train but one and make sure that one runs to time. I think the worse thing about the Connex debacle is that they were not booted out for the appalling service. They were on life support (DfT pays the bills to avoid the franchise failing) and the DfT thought they were spending too much in trying to actually improve the service (now it wasn’t their money). It would appear from the 18.00 news this evening, that the political situation has changed since you typed that, not so many hours ago. Beg to differ. Probably in the early days of “Southern” electrification ( i.e post 1925/6) & again after the 2-stage Kent Coast electrification. But, of course ( pace Straphan & WW ) that service was being run by competent professionals. Re amending timetables: the cut off point for Day 1 is publishing by 2200 on Day 0, ie the previous evening. Any cancellations or amendments after that count to PPM and CASL (Cancelled and Significantly Late). It also sets the baseline against which Schedule 8 of the track access contract is measured, ie delays and cancellations on the day, and the relevant ‘fines’ between NR and TOC. Note however that changes up to 2200 the night before are covered by Schedule 4 compensation in the track access contracts – however this usually applies only from NR to TOC, as it (sort of) represents a refund of track access charges if NR needs to cancel the train, plus lost revenue opportunity. Clearly if the TOC cancels the services of its own volition, it takes the hit on revenue and hasn’t already paid for most fo the track access charge (as it is largely fixed). @PoP: I will stay clear of passing judgement on the Connex debacle, my involvement with them was London Bridge to Waterloo East for only a week. However the Lewisham problem last year really made my blood boil. 1. The Sidcup line was without services. This was understandable as access was impossible. 2. The Orpingto/Sevenoaks slows were pretty much cancelled during the rush hour. Basically the only way for me to get home was to catch a Tunbridge Wells train and get off at Chelsfield. Go look it up on Google maps.. Fields on one side and a single, single decker little bus route on the other. When you have a problem on a scale like that, you would normally try and spend some time trying to work out a way of getting everyone home. I did not notice any improvement or even attempts at improvements until the tracks had re-opened. I’m sure even the most heartless banker would have put up with a five minute delay so that everyone else can go home too. @ Greg – We know Mr G wants different private enterprise companies brought in to deliver enhancements and undertake maintenance (Partnership and all that flim flam). That inevitably impacts Network Rail. For each person to judge if that means irrelevance or non existence. I suspect it really means “great big mess for his successor to sort out”. I think the ORR situation merely reflects the fact that there has not been a root and branch review and legislative restructure to reflect what ORR’s role should be when you no longer have a private sector infrastructure provider and when the DfT has significantly changed how parts of Network Rail’s funding and project portfolio is determined. The process and roles are changed as and when by the DfT to make their other decisions “work”. At some point someone will have to say that it is mildly ridiculous to have another public agency employ external consultants to run a rule over financing and project costings that have already been analysed and reviewed inside Network Rail and then by the DfT (who have probably employed consultants to do that work). How many times does the same number have to be checked and double checked? It makes little sense but, of course, DfT are happy because their stranglehold on the most expensive NR schemes is now complete. I’m not suggesting reform of ORR is easy. I just think the whole “HLOS”  and “SOFA”  and Periodic Review process needs reviewing. @WW and POP (and others) – re: revenue risk. Here, of course, is where the whole deck of cards falls apart (as repeatedly demonstrated on the ECML (East Coast Main Line) and also by the LUL (London Underground Ltd) PPP (Public Private Partnership (sic)), Carillion, Capita (just waiting for that one), and of course Railtrack, etc., etc). Namely – you can transfer short-term, and maybe medium-term, financial risk to the private sector. But the risk of service failure, and by extension, at the very least long-term financial risk, will always be with the public sector. That, or the service provision stops, at least as a service available to most of the populace. Longer franchises seem to be off the agenda. Maybe be a shame as with a long franchise the holder should be able to cope with the economic cycle as they know that there will be peaks and troughs. The dft would also not be constantly tendering contracts. I also ponder that as Network Rail is owned by the dft it no longer has the internal will power to criticise its owner. A private firm would fight back if the dft tried to shift the blame. This suits the dft. Remember when pre nationalisation the private firms paid MPs to flight their corner? That wasn’t an option for BR and isn’t for network rail. It made it very lonely when the government attacked rail. You may be right that ” Network Rail … no longer has the internal will power to criticise the DfT”. However, the only obvious route to fixing this problem would be to revive Railtrack (under another name, of course). I think that would generally be seen as rather a bad idea (think Hatfield, etc). Trains falling off the track would be a high price to pay for an enhanced ability to criticise a government department. “Get the politicians out of running the railways” is often heard. Until there is a big problem then it becomes “Get the politicians in charge of sorting out the mess”. So do we want them involved or not? The clamour is for someone to be visibly in charge and get things done when things go wrong. We see it in Scotland where it is very clear. For operational matters the person in charge (let’s call that person the PIC) is Alex Hynes – the MD of the Scotrail Alliance which includes NR – and for policy it is Hamza Yusuf, the Scottish Transport Minister. They have had their fair share of troubles over the last few months resulting from late delivery of the electrification and even later delivery of the trains, but from 400 miles away there seems to have been reasonable open-ness and honesty, with a fair number of actions to try and minimise the impact. But for Northern and, particularly Thameslink, who is actually in charge of the whole thing? In the BR days, accountability flowed down the organisation from the Chairman. In the latter days, on the Thameslink patch, it was clear that Chris Green was in charge with authority to act. As an example, if this was magically “the old days”, there was someone in charge and it become clear that there wasn’t the capacity to run all the London Bridge Thameslink trains to East Croydon, then a PIC would review that recommendation and come up with a plan which would start with “where should we send the ‘surplus’ trains?” I have no idea whether Rainham was a logical or sensible choice, but having made that decision the next thing the PIC would do is to require a plan (people, process and, above all money) to deal with it? The PIC would also have the competence to judge the deliverability of the plan and if there wasn’t enough time or money to hire and train all the staff needed then would realise that fact a long time before the event and put in place a different plan. It may not have been perfect but it would be a great deal better than what’s going on right now which feels – generously – like strike days when one runs what one can – not much – with the resource to hand. So, back to today; who is the PIC. Is there anyone other than a DfT civil servant who could get all parties in a room and command? I thought not. Is there a DfT civil servant with that competence and authority? (open question, but I suspect not). The SoS is in a role rather like the Chairman of a PLC – the Chairman should not be in charge of managing the operation; the Chairman has to make sure that the organisation has the capability to manage the operation and help the Board determine when changes of management should be made. Here there is no Board in the sense of having authority to decide and implement things. There is a Thameslink partnership board, and I’m sure it does a good job, but that job isn’t being accountable for the operation of the railway. A pity as the longest franchise ( Chiltern ) has easily IMHO been by far the most successful ever, & we wouldn’t want to repeat a success, would we? I’m horriby afraid that ideology will, actually, drive us twords railtrack-under-another-name. Especially as it appears ( And I stress appears ) that real actual enhancements & improvement are no longer wanted, because they cost money. I do hope to be proven wrong. @Malcolm – Instead why not restore the arms length mutuality of Network Rail, a company limited by guarantee without shareholders to pay, an apolitical mission only to ensure the maintenance and improvement of the nation’s railway infrastructure, and an ability to borrow on the open market? I read EU rules were the primary reason the company and its debts had to be brought onto Government’s public sector books. Is not Brexit an opportunity to reverse this? Banks were very willing to lend billions to NR it seems as they understand that good infrastructure is the lifeblood of the country’s economic organism. Was not the recapitalisation of the railway by these financiers not a worthy use of all that quantitative easing? EU rules were certainly quoted as the reason NR had to have its debt counted as public sector debt. But the chain of reasoning which is supposed to lead from that to a situation as described by 100andthirty with no-one apparently in charge strikes me as a bit hard to follow. Railtrack debt was not public sector debt – my mother owned a bit of it – but it did not succeed in its mission to provide a canvas on which train operators could paint wonderful pictures either. (Nor did it succeed in making money for its investors, as it happens). Given the emerging visibility of NR project costing headaches, in some cases causing unbudgeted delays in delivery, others causing £00m/000m of overspend compared to the original project budget, it is unclear what credit rating the international agencies would now give NR or a successor if it were desired to relocate the organisation to the private sector. The financing world is different to 2014. TfL says this about its credit position: https://tfl.gov.uk/info-for/investors/credit-highlights. When you look at the attitudes of the three big credit agencies, only two of the three are rating TfL solidly for a stock market equivalent of a ‘buy’, even with a British Government backstop. A link here shows more detail: (in sequence, Long-term rating / Short-term rating / Outlook): https://tfl.gov.uk/info-for/investors/Ratings, and you can delve even more if you want, into the individual assessments. Standard & Poor’s says (LR/SR/Ou): AA- / A-1+ / Stable. Moody’s says: Aa3 / P-1 / Stable. Fitch says: AA- / F1+ / Negative. All rely heavily on the UK government eventually underpinning TfL’s borrowings if TfL suffered a reverse. Now, would the same be the same for private sector engagement once more with national railway infrastructure? You might expect that to be written in metaphorical blood in any third party’s deal with government, otherwise the third party might be afraid of losing their investment with a Carillion-type implosion or, with a different political party, re-nationalisation with limited compensation. None of this is terribly propitious, at this point in time, for a large-scale infrastructure expedition into the private sector. Whether private involvement could be leveraged into becoming a mainstream solution for a wide range of enhancement proposals, or for operations and maintenance and renewal (OMR), would be a fundamentally different matter – and not seriously credible at this stage with an NR balance sheet already weighed down with over £40bn of debt. Each new enhancement project would have to be capitalised in its own right (rather like the former DLR infrastructure scheme to build the Lewisham extension), rather than be linked to the general rail infrastructure debt. I won’t even begin to work out how individual devolved nations in Scotland, or Wales, or for that matter a Sub-National Transport Body in an English region, would assess the risk of having to absorb their share of the ex-Network Rail debt, if a private sector market failure meant that they had to be responsible for servicing their allocated share of the ex-NR debt – a lead weight which is a function of the previous scale of expenditure on the NR ‘credit card’! Overall, it is reasonable to assume that the government of the day will be stuck with funding NR’s debt mountain and the cost of OMR – and most of the enhancements. @ Milton Clevedon – you may well be right about HMG being lumbered with Network Rail. However there are real risks from Mr Grayling dabbling around with other private sector parties to do part of what NR does now. Splitting maintenance from replacement and then split again from enhancement and potentially having to have some form of “handover” or “reversion” to Network Rail at some point in the future just creates risk. Given private sector contractors already do a lot of the replacement / enhancement works under contract to NR I have to wonder what the point is. I can’t see there being sufficient cost saving / efficiency gain these days to outweigh the potential additional risk. I am obviously guessing as to what Mr Grayling may have in mind but transport history is littered with examples of badly constructed “new ways of doing things” where boundaries and responsibilities are badly defined / poorly understood. This leads to accidents or poor management of the aftermath. A massive amount of work will be needed to remove such risks and ensure all interfaces are mapped, understood and properly covered in whatever contractual construct is created in future franchises that incorporate some form of infrastructure responsibility. And to think East Coast Partnership is supposed to be in place in roundly 2 years – some hope! I fear you are not pessimistic enough. One: – with the all-around chaos enveloping both government & the so-called “opposition” because of Brexit, even with the current high-level of publicity over the “slink” & for that matter, Northern, Mr G is probably “safe” – even given his previous track record in various state offices. Two: – other ideological considerations in favour of”pure Private Sector answers” (If you see what I mean) mitigate against any significant future real investment. Three: – Known “enemies” of rail transport in senior positions, or recently retired, but still on the general scene, now all saying, loudly “I told you so” & pushing to make sure no state monies go to anything for rail. Four: – The amazing prevalent trend for wonderful vapourware, as skewered in this weeks Friday Reads ( “Gadgetbahnen” ) is already leading to the desire to spend money on these rather than anything that, you know WORKS…. They key problem, as far as I can see, is that DfT does not wish to accept responsibility for the management and direction of Britain’s rail services, indeed, will fight tooth and nail to avoid being held to account. While that situation continues, whatever underlying structures are devised and implemented there will always be a problem. Unless complete responsibility is hived off to the private sector (with the almost certainty of a replication of the Railtrack fiasco), the Government will always hold the whip hand. But if they will not take responsibility for this then there will never be an appropriate degree of accountability, nor will we avoid a constant repetition of the problems we have seen with, eg, East Coast, timetable changes, investment strategies and so on. Correct … except that the ultimate responsibility held by the DfT is gradually creeping up the public consciousness. Update on ThameslinkBuddy.com which was referenced in the article. You no longer have to register to view today’s details (including ‘whooshers’). If you do register then you can access historical data all the way back to 15th December 2016. There is also tweet by the author of the site stating that in the near future he hopes to capture stats for cancelled trains that got deleted from the Journey Planner database. This can’t be retrospective because he needs to capture the data in advance. We have not heard from Lord Dawlish. Is he alright? Over the weekend I emailed a load of questions about the original Thameslink implementation to him which he comprehensively answered in a way that only he could (free Paul Channon story thrown in). So he still has mental capacity. @ Greg – I think you may be the only person in the world to have accused me of being “too optimistic”. Fair made my jaw drop did that remark. As if Grayling hasn’t got enough on his plate, the proposed 4th runaway at Heathrow (with an announcement due soon according to BBC news) is going to prove divisive for West London MPs (and no doubt others too). Looking forward to LR’s contribution to the debate! 4th runway? They haven’t decided to build the 3rd one yet. The saga of a new runway at Heathrow or Gatwick still has a very long way to run. Does this mean that Grayling will be kept in post as minister for disasters? Duly noted. I blame it on my dyscalculia! However in the 1950’s Heathrow had 6 runways according to Wiki! I have just read the Yorkshire Post’s leader about the chaos. It is one of more than 20 titles that have abandoned rivalries to unite on getting a fix. * promise that the planned high-speed line across the Pennines – Northern Powerhouse Rail – will take precedence over or equal to the second Crossrail scheme being drawn up in London. Yes, it had runways in different directions, to be used according to the wind conditions. You can still make out where they were on an aerial photo. At least one of them remained technically a runway until relatively recently, but because it is shorter than the main east-west ones, and cannot be used at the same time as them, it was (almost?) never actually used. Now I believe expansion of the terminals has left none of the additional runways usable. In any case, as the runways could not be used simultaneously, they provided no additional capacity, Heathrow has never had more than two runways that can be used simultaneously. Phil Harmonic/Mark B. As originally built, Heathrow had 6 runways arranged in a ‘Star of David’ pattern. Any two parallel runways would be used depending on wind direction. The disused four were discontinued largely because they could not be extended to cope with larger aircraft that needed longer take off runs. The exception was 23 which remained in use until the early 2000s (2002?) and was sometimes favoured by DC8s and 707s which had difficulty in strong crosswinds. Occasionally 23 was used when 09/27 were also both in use so not quite correct to say they could not be used simultaneously but the concurrent use of 23 required such long separation between aircraft that it actually reduced overall capacity. The current philosophy regarding Crossrail 2 is that it will only happen if Northern Powerhouse happens and the buzz word is ‘lockstep’. They might push for their scheme in advance of Crossrail 2 but in reality the government (regardless of which party in power) probably wouldn’t dare do one without the other. Almost inevitably Crossrail 2 will take longer so the people up norf will probably get their wish – or they will get nothing and London will get nothing.